As you all might have understood by now, i love love LOVE to cook. 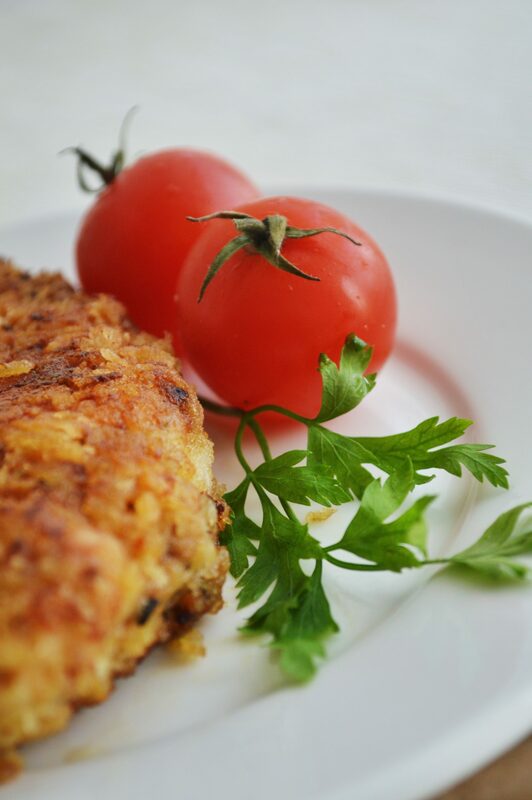 I love to try out new recipes all the time. I usually don’t like making the same dish over and over again. I get bored. So we don’t have many recipes that are in rotation at home. But when it comes to eating from restaurants, its always the same thing i order. I have a particular dish allotted for each restaurant. I have to order only that when i get there. Dunno y!! 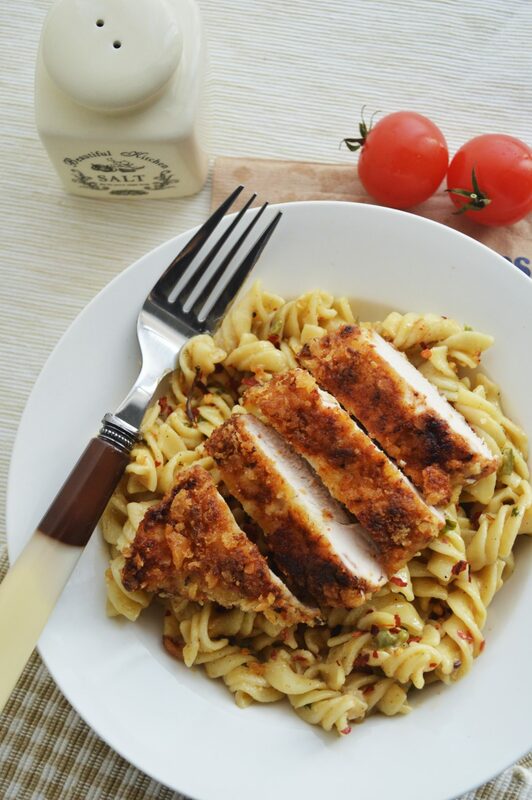 Louisiana chicken pasta is the one i have to order from cheesecake factory. Always! Its soo worth it, maybe thats why. My favorite thing about this pasta is the contrast in flavors and textures. 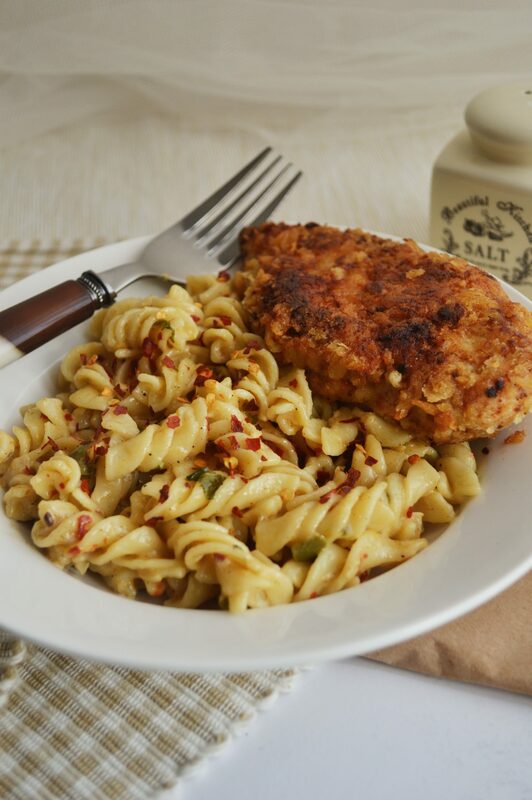 The crispy parmesan chicken breast, the creamy pasta, the bell peppers and the tangy and spicy cajun sauce all over just comes together perfectly. I make this just once in a while for dinner, since it is so rich. If you want to put on few extra kilos, do have this often. Hehe! Otherwise, you all know what to do. 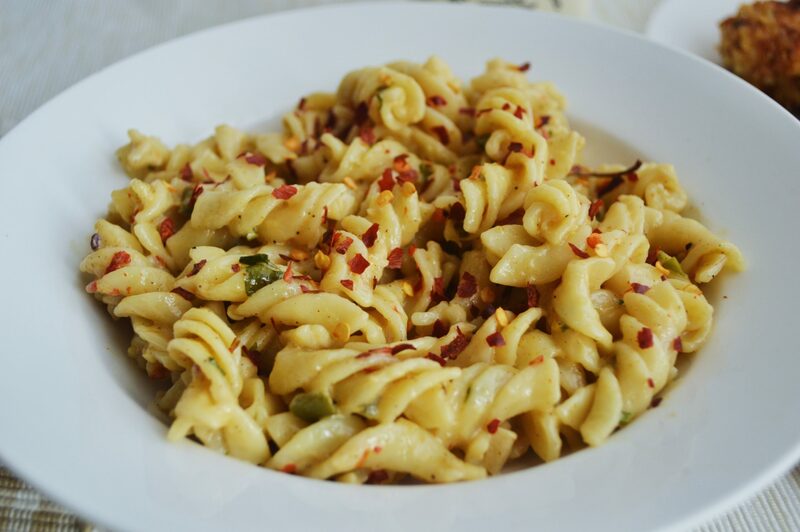 But do DO try making this super yummy pasta, i am sure you all will love this. 1. Melt butter and olive oil in large skillet over medium heat. 2. Add the peppers, and onion to same skillet, until crisp-tender, about 4 minutes. 3. Add garlic and crushed red pepper to skillet and sauté 3 minutes. 4. Add whipping cream and chicken stock. Add in the cajun spice. 5. Simmer until sauce re-heats and thickens slightly, about 5 minutes. 6. Add basil and Parmesan cheese to sauce, stirring to incorporate. 8. 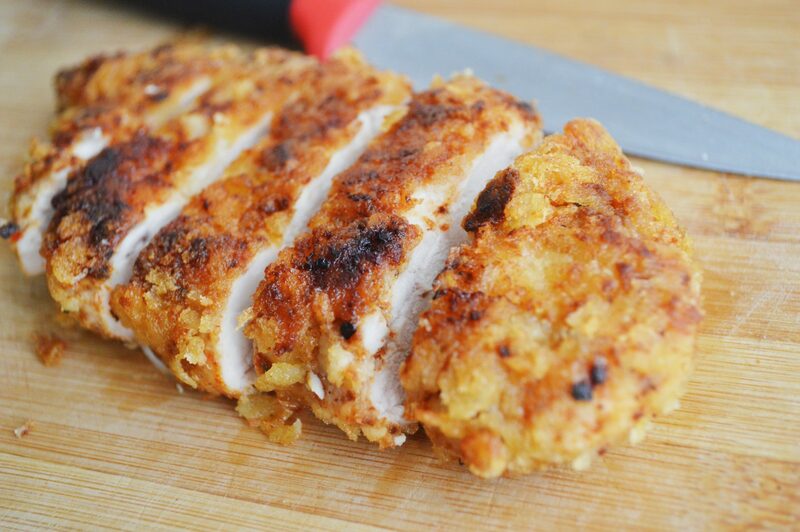 Wash and drain chicken breasts. Season chicken with seasoning. 9. 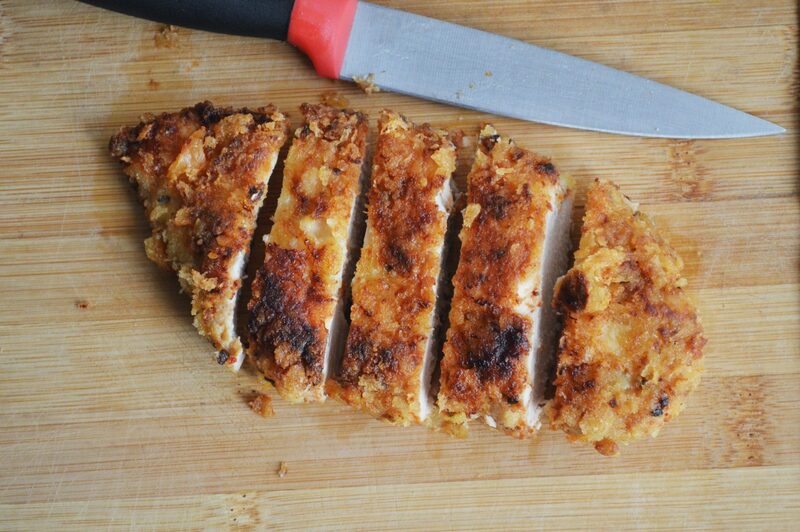 Pound until very thin (the thinner the chicken breasts the better). 10. 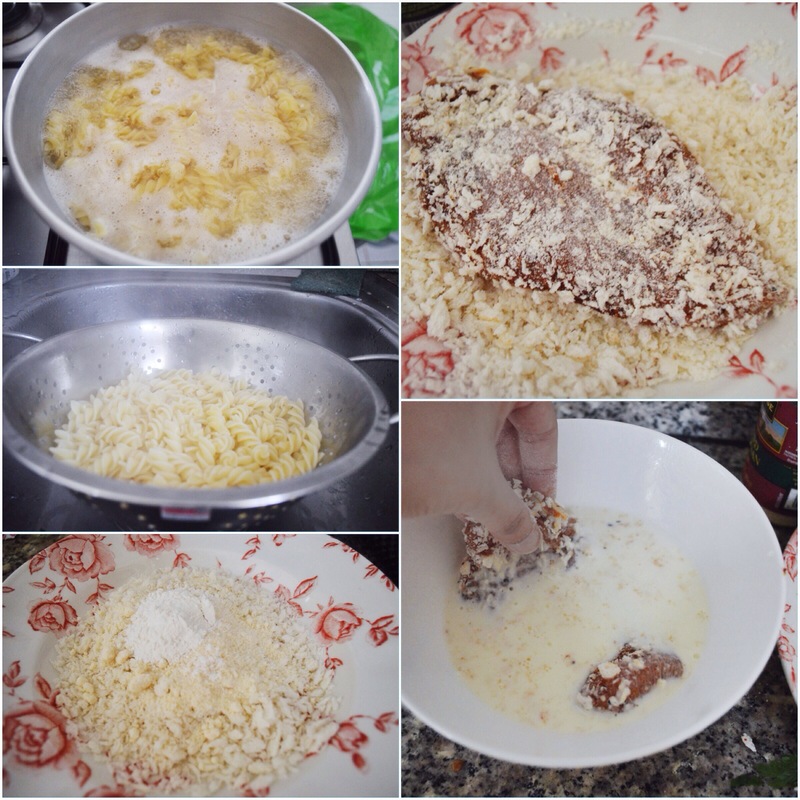 Mix breadcrumbs, flour, and Parmesan cheese together. 11. Place milk in dish for dipping. 12. 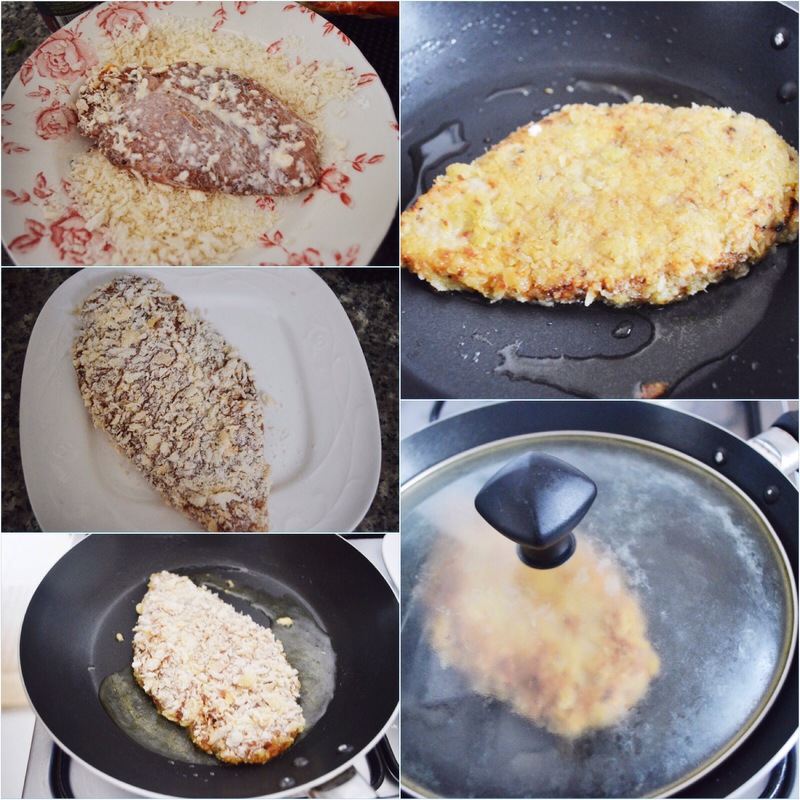 Dip chicken in breadcrumb mixture and then in milk and then back in breadcrumbs. 13. Place in fry pan that the oil has been heated and fry at medium high temperature until golden crisp and cooked through. Add more oil as needed. 14. Remove and drain chicken; keep warm. 15. Meanwhile, cook bow-tie pasta in large pot of boiling salted water until tender but still firm to bite. 16. Drain and return to pot. 17. Add sauce and toss to coat. 18. 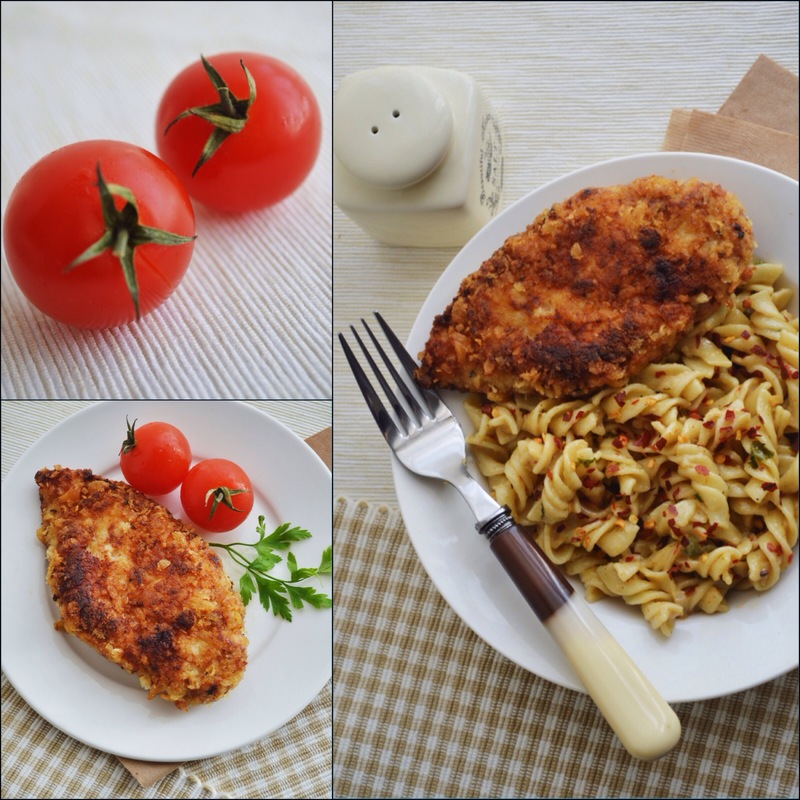 Place pasta with sauce on plate, and top with chicken breast. 19. Serve, passing additional Parmesan separately. ✔️ When frying the chicken follow these steps. First on medium heat place the chicken on the pan. When it turns light golden brown turn it. Again let that side also turn golden brown. This might take only 2-3 minutes per side. Turn over again and close the lid. Let it cook for 5 minutes. Then turn again close the lid and cook for another 5 minutes. The chicken must be done by then. The chicken shouldn’t be overcooked or else it would become hard. 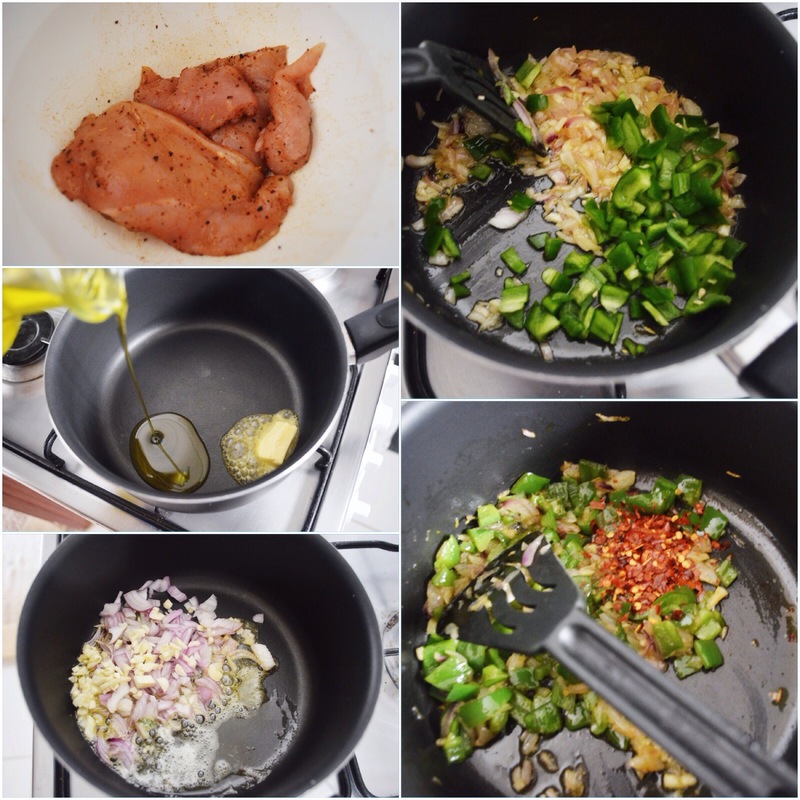 By cooking in the above mentioned way you will get tender, juicy chicken. ✔️ Try to pound the chicken very well. The thinner the chicken, the better. I think i didn’t hit it hard enough, so it was not very thin. Im sure it would have tasted even better if the pieces were very thin. Melt butter and olive oil in large skillet over medium heat. Add the peppers, and onion to same skillet, until crisp-tender, about 4 minutes. Add garlic and crushed red pepper to skillet and sauté 3 minutes. Add whipping cream and chicken stock. Add in the cajun spice. 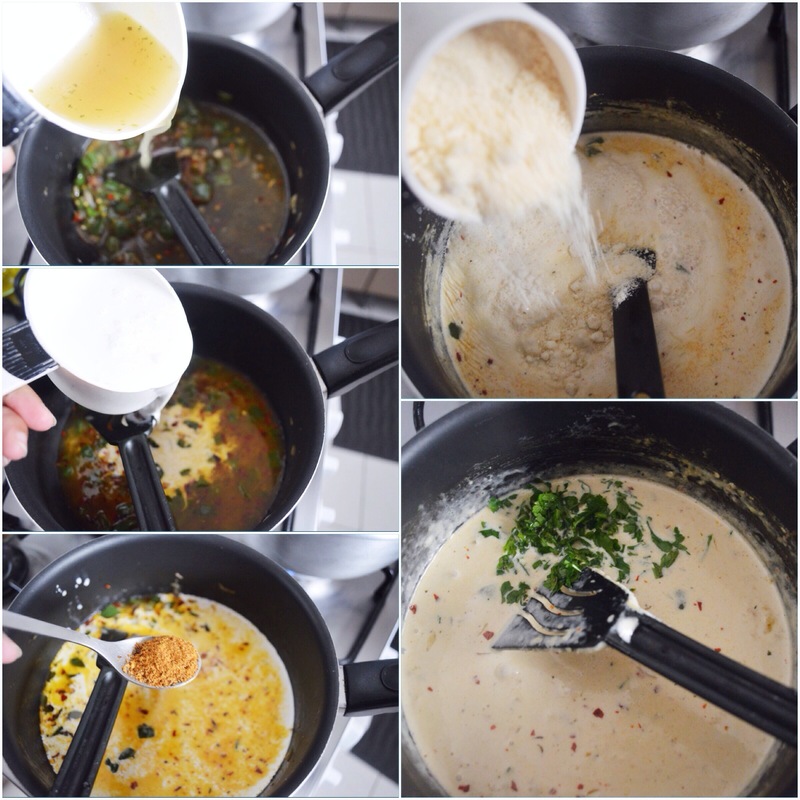 Add basil and Parmesan cheese to sauce, stirring to incorporate. 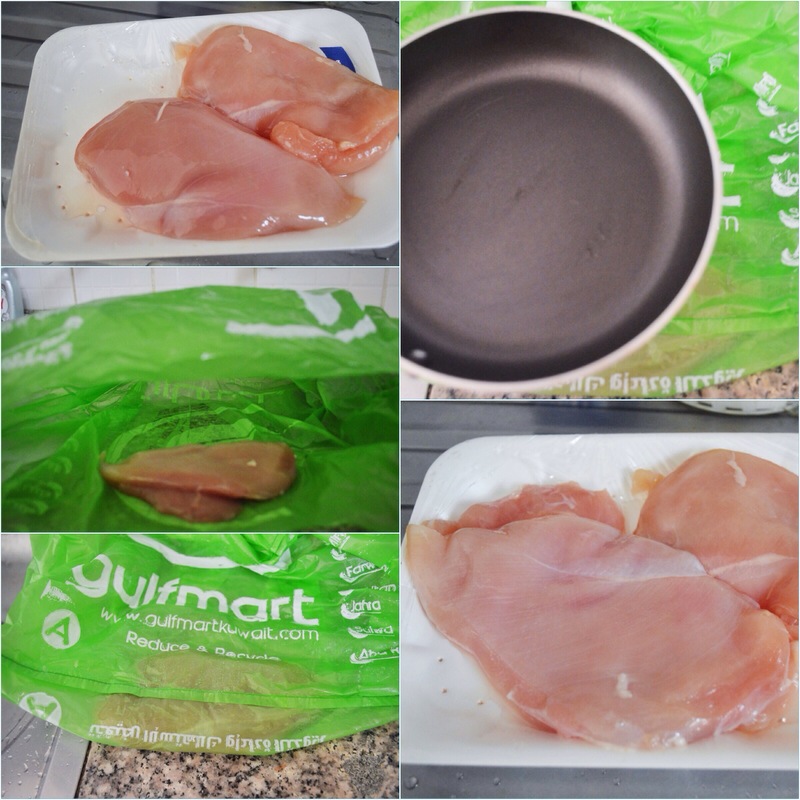 Wash and drain chicken breasts. Season chicken with seasoning. Place in fry pan that the oil has been heated and fry at medium high temperature until golden crisp and cooked through. Add more oil as needed. Gorgeous pics, Sadia. 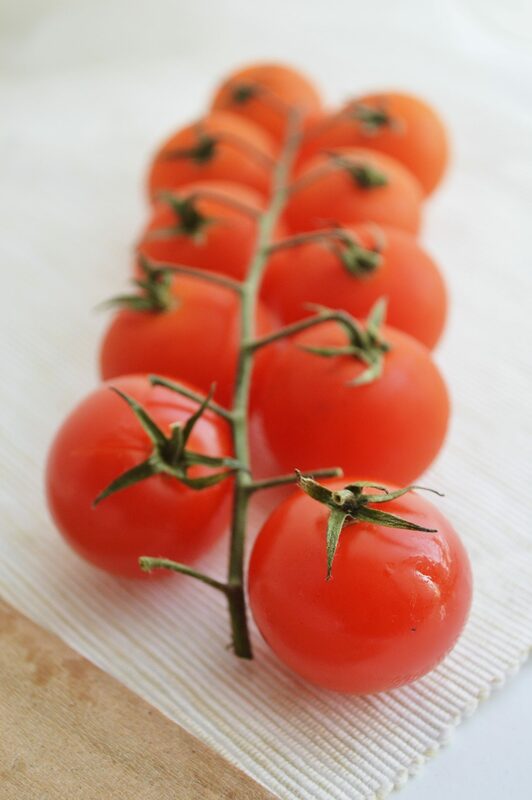 Especially the one of the vine tomatoes. I love how evenly lit your pics are. Do you use a light box? Thankyou Anjana! No, i dont use a lightbox. I often take the pictures near my balcony where i get perfect natural light. That kind of pasta is what I often do when I don’t know what I want to cook. Next time I’ll remember this and add some chicken! 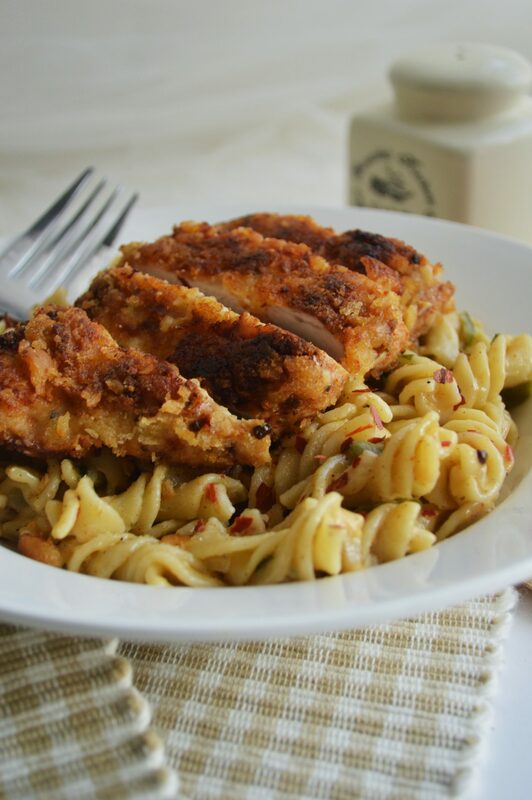 I would certainly want to eat Louisiana Chicken Pasta. Sounds very delicious! Curious – the post reads “Recipe Courtesy:” but doesn’t say who from? I really enjoyed reading this post. I like your writing style! Your prose is witty, cute and funny. 🙂 I do not need ANY extra kilos (or even ounces!) but I do need to try this delicious recipe. You explain the various steps very well, so I am sure it would turn out to be oh-so-delicous. On a completely different note, I had NO idea you had Cheesecake Factory in Kuwait! It is quite common here in the States. Shows how little I know! Have a great weekend – thank you for sharing! Hey there Shanna! Oh yeah i have been struggling with this recipe courtesy thing. Dunno why, but after the update in WordPress i just cannot add any link. I feel soo bad too that i cannot give the due credit to the original author. Waiting for a new wordpress update, hoping they will fix it soon. Oh thanks for trying. So happy that you liked it.